The largest Itikaf gathering after the one held at Two Holy Mosques continues with traditional fervor in Township Lahore under the banner of Minhaj-ul-Quran International. 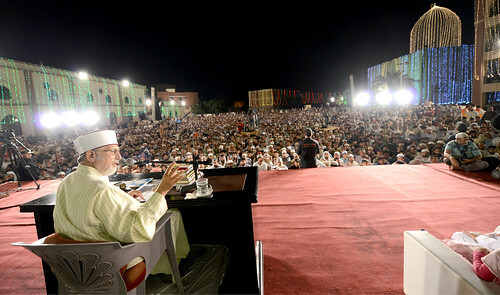 In addition to daily special lectures of Shaykh-ul-Islam Dr Muhammad Tahir-ul-Qadri, an educational intellectual sitting is held every day on various jurisprudential and religious issues for the participants of Itikaf City in which Mufti Abdul Qayyum Khan Hazarvi replies to the questions of the people in a very lucid and easy-to-understand manner. A special curriculum has also been designed for this sitting. In a sitting, Mufti Abdul Qayyum Khan Hazarvi gave special instructions regarding the manners and etiquettes of observing Itikaf. He said that one faces many difficulties when one sets out on the right path, adding that only those succeed not only in this world but also in hereafter who remain steadfast. He said that Islam is a religion of welfare and those who promote its teachings actually work for the well-being of humanity. He said that it is due to our estrangement from the religion that we continue to face humiliation at several fronts. In addition to lectures by Mufti Abdul Qayyum Hazarvi scholars of Minhaj Ulama Council, Directorate of Training of MQI, and teachers and students of COSIS are taking part in the training sessions for moral and spiritual education of the participants.